With art galleries, fascinating architecture and incredible cuisine, there’s no shortage to things to experience in Mexico City’s Historic Centre. But for something completely different, head 20 kilometres outside the downtown core to the floating gardens of Xochimilco Mexico City. This network of canals dates back to the time of the Aztecs, when the ancient peoples produced food on chinampas, pockets of arable land floating on the shallow lakes beds of the Valley of Mexico. It’s definitely worth visiting if you’re in Mexico City for three days or longer. Today, you can glide through these canals in a trajinera, a brightly painted Mexican gondola, while enjoying food, drinks and entertainment along the way. It’s one of the top things to do in Mexico City for visitors and a very popular activity for locals celebrating birthdays, engagements or family special occasions, so if you can go during the week when the crowds aren’t as large. It’s also the kind of activity best enjoyed in a group or as a couple, so if you can gather a group of friends you’ll have more fun. 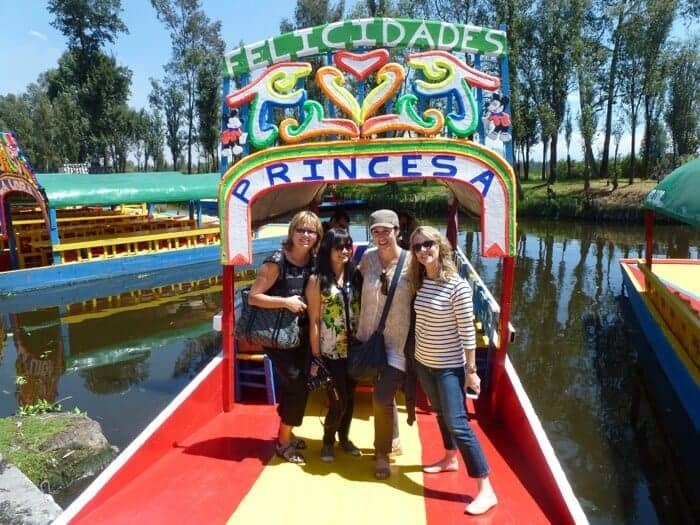 Book one of the boats and you’ll float through the peaceful canals learning about ancient traditions and enjoying food, drink and even mariachi music. Prices are posted at the Embarcadero ( dock). One of the strangest sights I saw along the way was a display of dismembered dolls affixed to trees. It was an eerie rather creepy sight and is a top spot during Day of the Dead when performances of the legend of la llorona take place in the neighbourhood. La Llorona ( The Weeping Woman) is a woman who killed her children to be with her lover and after he deserted her, she roams the streets –from Guatemala to Mexico– lamenting the loss of her children for eternity. But the Island of the Dolls or Isla de las Munecas was actually created by a local who found the body of a young girl floating in the canal. Unable to save her from drowning, he collected dolls and attached them to trees on an island as a form of memorial. Legend has it that her spirit now lives through the dolls and witnesses have reported seeing dolls’ limbs move, eyes open and other strange happenings. I wasn’t keen to find out for myself so focused on sipping tequila and eating grilled corn that miraculously appeared from floating vendors. 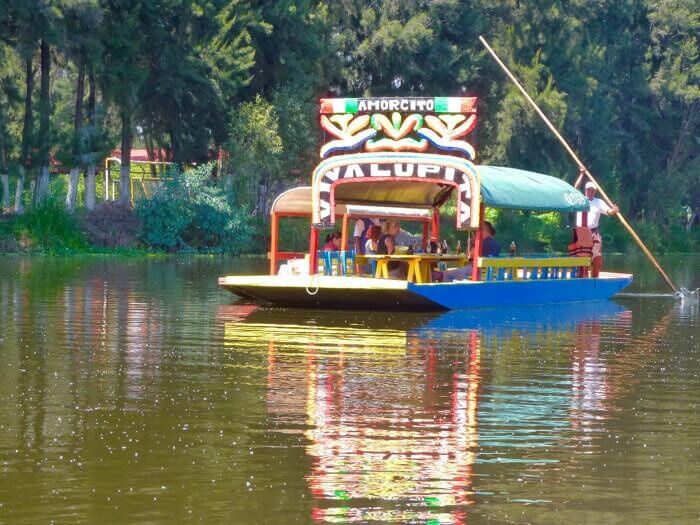 Xochimilco also happens to be located near the fascinating Olmedo Patino Museum, a historic hacienda that’s home to an important collection of art by Diego Rivera and Frida Kahlo plus vast botanical gardens and folk art. If you’re looking for high quality souvenirs, the gift shop is one of Mexico City’s best. 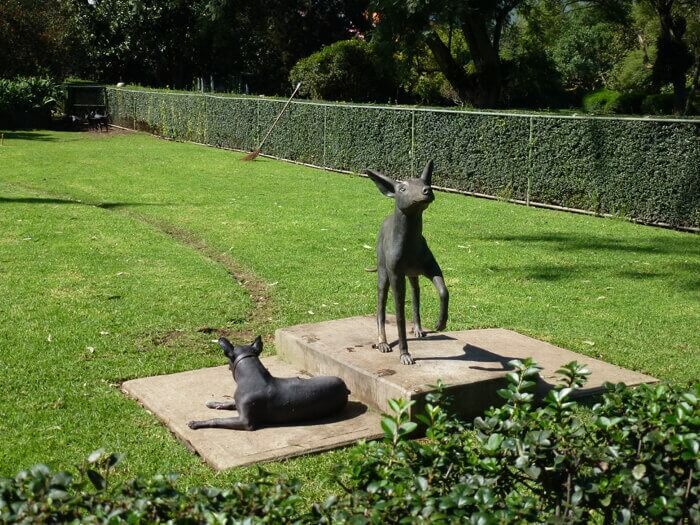 Dog lovers will enjoy learning about the museum foundation’s efforts to bring back the ancient Mexican dog breed, the Xoloitzcuintle or Xolo, a hairless canine once considered a holy animal by the Aztecs. Getting to Xochimilco Mexico City: Expect it to take 90 minutes by public transit. First, take Metro Line 2 to station Taxqueña. From there exit and take Tren Ligero (light rail) and pay an extra fare. Ride the light rail to station Xochimilco, the very last station. Walk or take a bicycle taxi through the market and village to the canals. Or, if you’re in a group it can be cheaper and more convenient to take a taxi from your hotel. Tours at Xochimilco Mexico City: Prices are fixed ( posted on a billboard at the dock) depending on the size of the boat but you can try to negotiate for more time. Vendors and roving mariachis float up to your boat to serenade you, offer drinks and tasty grilled corn with chile, lime and mayo for an extra fee. There’s so much to explore in Mexico City, it’s easy to become overwhelmed by choices. 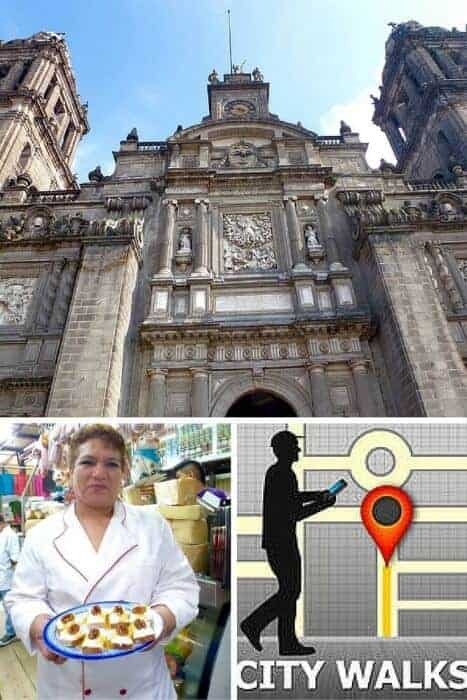 To help you organize your time in Mexico City, we’ve collaborated with GPSMyCity, to offer A Taste for Travel subscribers a FREE full version of the Mexico City Map and Walks app for iPhone, iPod Touch and iPad. You can read all about the handy Mexico City app on the iTunes page. 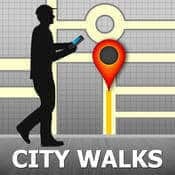 GPSMyCity offers two city walks apps for each city, a free version and a paid one. In the free version, users can view all the walk content, but WITHOUT any navigation assistance. For example, NO detailed walk route maps are included in the free version. 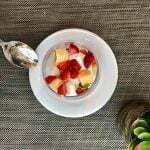 The paid (FULL) version available to A Taste for Travel subscribers comes with everything. You can even create your own customized itinerary. 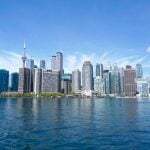 A FULL version of the app means that a detailed walking route map and turn-by-turn walking directions are provided in each walk, so you can confidently “lose yourself” on your trip, but not get lost along the way. What’s also great about this, is that once you’ve downloaded the app it will work offline without internet connection. 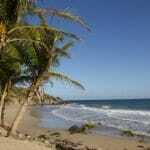 This means you don’t need to purchase mobile data plans or worry about paying roaming charges while in Mexico. We have a limited number of FREE promo codes available for the FULL version of the GPSMyCity Mexico City app so if you’re interested in trying the Mexico City Map and Walks app, subscribe to the A Taste for Travel newsletter and email us at info@atastefortravel.ca to request the promo code. The floating gardens of Xochimilco sound like a lot of fun (aside from the creepy dolls). I like visiting botanical gardens and I like folk art so I’m pretty sure I’d enjoy Olmedo Patino Museum as well. This looks like such a fun excursion when visiting Mexico City! I can’t even pronounce some of the places in Mexico! The colours are so vibrant but the dismembered dolls would kind of freak me out! Wow – this is a place I never new until I read this wonderful post. The baby dolls on the trees honestly would have done me in. It would be hard to focus on all of the other natural beauty, however I would really like to see the historic art collection of Diego Rivera and Frida Kahlo. We ran into a small display of dolls hanging from a tree on Big Corn Island off the coast of Nicaragua which definitely gave me the creeps so I can understand your reluctance to check out the Isla de las Munecas! However, the Olmedo Patino Museum sounds fascinating and a must see if we visit Mexico City. I’ll also be checking out GPSMyCity – just what I need since I spend a lot of time wandering around new cities and have no sense of direction! I’ve been to Xochimilco but never heard about the Island of the Dolls. Weird and wonderful indeed. Island of the Dolls sounds very creepy but interesting. I’m with you I’d stick to the tequilla and not look too close! Love Mexico! I’ve been going since my early 20’s and still try to get back once or twice a year. It’s been a long time since I’ve been to Mexico City — absolutely going to go to Isla de las Munecas next time! What a wild place! So fascinating about the dolls, I have never heard of that before!